Are the living primates truly the most highly encephalized order among extant mammals? This is partly a semantic issue, revolving around how one defines "most highly encephalized." Stephan (1972) maintained that while high encephalization was obviously characteristic of Homo, it was just as clearly not uniformly true of the entire order. Martin (1973), Radinsky (1970, 1975), and others have also shown that primates are not unique in their high level of encephalization. There is considerable overlap with other mammals, particularly those highly encephalized cetaceans (Jerison, 1973; Marino, 1996, 1997), but also with selected carnivores, rodents, bats, and other taxa. Yet these assessments deal with issues of overall variance, range, and overlap. 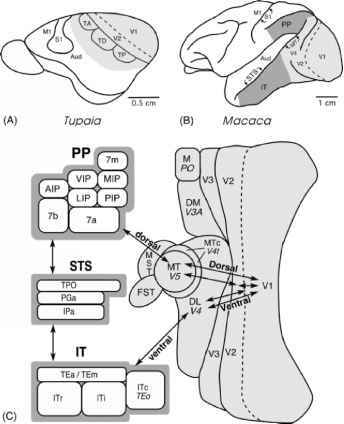 Of course not all primates exceed all other mammals in encephalization, and various extant primate species (particularly among the strep-sirhines) exhibit only average levels of relative brain size. Nevertheless, as a group, the primates exhibit the highest average level of encephalization among mammals. Figure 2. Brain-body scaling in mammals (solid line determined from Jerison's 1979 dataset), illustrating the general high relative brain size of primates (open circles) in comparison to mammalian averages. Additional points labeled: H. sapiens; H. erectus; Z = Zinjanthropus (Australopithecus boisei); A = Australopithecus africanus; C = Pan troglodytes; G= Gorilla gorilla (from Gould, 1975a). Various lines of evidence support the generally high level of encephalization seen in extant primates. Figure 2 illustrates a plot of selected primate species relative to Jerison's (1973) extant mammalian baseline. While some primate species approximate the line for average brain size at a given body size, many are well above the central trend. Martin's (1981) plot of brain and body sizes in extant mammals also demonstrates the generally high level of encephalization in the primates. 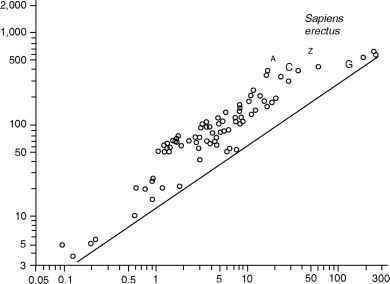 Austad and Fischer's (1992) tabular summary of EQ values for modern mammals, computed from Eisenberg's (1981) database relative to a line of best-fit with a slope near 0.75, demonstrates the high average level of encephalization for primates (Table 1). A plot of average ordinal values also demonstrates primates as a group to have the greatest positive deviation from the line of best-fit (Figure 3). *Data from Harvey et al., 1987. Data from Eisenberg (1981), except for primates, as noted; modified from Austad and Fischer, 1992.